Based on her past successes with difficult texts by Samuel Beckett and Harold Pinter, it would seem logical to pair such a perceptive director as Jennifer Tarver with Hedda Gabler (1891), one of Henrik Ibsen’s greatest plays and a precursor of Beckett and Pinter as a study of existential angst. Yet, there are difficulties with almost every aspect of Tarver’s production, a co-production of Necessary Angel and Canadian Stage. Just as a production of Hamlet about a man’s inability to take decisive action should not itself be indecisive, so a production of Hedda Gabler about a woman who is bored with life should not itself be boring. One can tell there will be difficulties just by looking at Teresa Przybylski’s unusual set. Tarver and Przybylski have placed the set on a platform and pushed the drawing room where all the action take place to the front one-third of the available acting space in the Berkeley Street Theatre Downstairs. 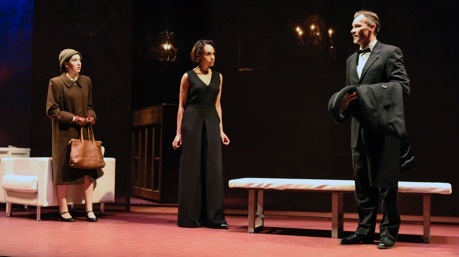 The positive side of this and the set’s low ceiling are their embodiment of the claustrophobic environment that Hedda Gabler perceives as her life after her recent marriage to an ernest but dull young academic. The shallowness of the room gives the impression that all the characters are acting on the edge of an steep drop. The negative side of such a long narrow set is that it means all that action has to be blocked laterally and almost never front-to back which leads to an overriding feeling of artificiality of movement that the finest acting can seldom overcome. Worse is the omission by Tarver and Pzrybylski of one of the key features of the setting as Ibsen describes it: “Over the sofa hangs the portrait of a handsome elderly man in a General's uniform”. Ibsen’s stage directions are not obsessively novelistic as are Shaw’s. If he mentions a detail like this it is important. In this case the portrait is of general Gabler, Hedda’s father, who, despite his death, remains a the central determining factor in the way Hedda acts. Just as Jean Racine’s Phèdre can never escape the gaze of her ancestor Helios, the sun, so Hedda should be seen as never being able to escape the internalized approval of her strict, socially conscious father. The importance of this is reflected in the play’s title. Hedda is married to George Tesman, but Ibsen deliberately calls the play Hedda Gabler to show that, despite her marriage, she is still her father’s daughter. Just because Tarver has relocated the action from the 1890s to the 1950s doesn’t mean the portrait should be forgotten. With such a significant aspect of the set missing, it’s not surprising that other significant aspects of the play should go missing as well. In her Director’s Note, Tarver states, “As I delved deeper into this text I was struck by how each of the characters could be defined by a type of blindness. Not literal blindness, of course, but rather various forms of tunnel vision or willful blindness”. That blindness may be present in the characters to some degree at the beginning of the action. Hedda wanted to marry a respectable young man like Tesman, but did not realize how boring her life would be as a result. Tesman is blind throughout to Hedda’s unhappiness. Tesman’s Aunt Julia thinks that Hedda’s strange actions are the result not of an inherently destructive nature but of her being pregnant. Judge Brack thinks that he can arrange a form of ménage à trois with Hedda without any negative consequences. Unfortunately, for her direction, the key to the play is not the characters’ blindness but their progressive self-awareness. Tesman may have dedicated his life to studying the domestic handicrafts in Brabant in the Middle Ages, but he is not so blind that he cannot see that the book of the undisciplined Eilert Lovborg is superior to anything he could ever imagine let alone write down. Aunt Julia may not have much insight into Hedda, but she does understand Tesman, and when her invalid sister dies, she decides to take in another invalid because she realizes that she has a talent for caring for the ill. And for Hedda herself Ibsen presents almost a step-by-step depiction of how a woman who longs both for freedom and respectability comes to recognize these as irreconcilable forces in her nature whose conflict prevents her from attaining either. Hedda Gabler is often called the role in dramatic literature for female actors that is closest to Hamlet for male actors. The reason is that both characters have such internally contradictory natures that no one performance can hope to bring out all that is there. Both are severely depressed and unable to take major action – leaving her husband for Hedda, killing Claudius for Hamlet – yet both commit a number of smaller actions – burning Lovborg’s manuscript, killing Polonius – that set counteractions in motion that lead to their undoing. Both are acutely aware of their inherently cowardly natures, but both end their lives in ways they can perceive as heroic. Blindness is a static quality whereas growing awareness is not. That helps explain why in Tarver’s hands a play that is one of Ibsen’s most gripping here becomes languid and dull. Part of this also has to do with the uneven cast. 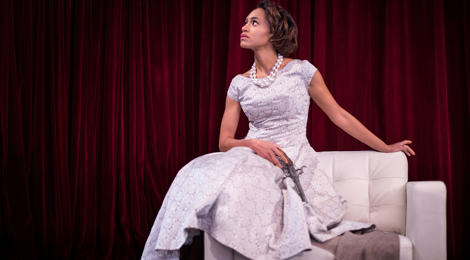 It’s easy to understand why Tarver cast Cara Ricketts as Hedda. 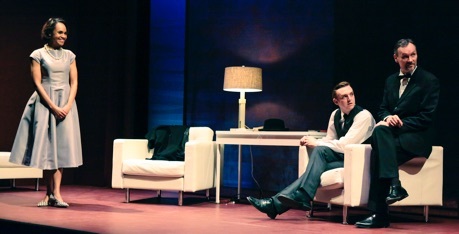 In Pinter’s The Homecoming directed by Tarver at Stratford in 2011, Ricketts was thrilling as Ruth, a dynamic woman married to a nerdy husband, a situation superficially similar to that of Hedda married to the scholarly Tesman. The difference is that Ruth’s motivations remain enigmatic whereas Hedda’s motivation stems from a mass of contradictions of which both she and we are aware. When Ricketts first enters as Hedda with a genuine smile on her face, we have to wonder where the depression is that is Hedda’s most obvious characteristic. Unlike Moya O’Connell in the Shaw Festival’s Hedda Gabler of 2012 or Yanna McIntosh in Volcano’s production of 2005, Ricketts is not able to sustain an underlying emotion and layer it with two or more other emotions so that Hedda’s anguish is always present even when Hedda is scheming, flirting or pretending to be lively. Instead, Ricketts moves from emotion to emotion without linking them to each other or to a fundamental condition beneath them all. Ricketts is best at conveying Hedda’s quicksilver temperament but her dangerous games with guns or fire always seem more like mischief than the malevolence they should be. The two cast members most secure in their roles are Steve Cumyn as Brack and Kate Hennig as Aunt Julia. Cumyn’s Judge Brack is an old-school Machiavel whose only sphere of influence is not a nation but the small town he lives in. Much as she refuses to acknowledge it, Hedda’s attempts to control people through her schemes are not unlike Brack’s, which is why he recognizes in her a kindred spirit. Cumyn is marvellous in the way he has Brack present a smooth exterior, appearing debonaire or concerned as needed, but always clearly a façade. Tarver had the odd idea of having Brack enter the stage from the audience at the beginning and depart into the audience as the end as if she thought Brack were somehow our representative on stage. This is true only in Brack’s final famous statement, “People don’t do such things”, but it is a mistake to suggest that in the rest of the play so devious a person represents society in general. That society is more likely embodied in Tesman’s kind-hearted Aunt Julia who lives happily in the small world of family and duty. Hennig accomplishes the difficult task of making Julia both comic and sympathetic. We may laugh at her but it is simply because we all have so many relatives with similarly narrow concerns. Julia is parallel to Hedda in that both seek a purpose in life. With the death of her invalid sister, Julia discovers that she does have a purpose – taking care of people – a solution to the existential dilemma that looks forward to the later views of Albert Camus. Hedda, in contrast finds that to her horror she herself has none. Frank Cox-O’Connell seems to have been directed to emphasize Tesman’s boyishness. He may be a scholar with a doctorate in an obscure field but in his general oafishness and innocence Cox-O’Connell makes him seem more like a prepubescent student. This approach accords with Tesman’s manner when near his favourite aunt, but it does not work so well when realize that Tesman is not a fool. Hedda is pregnant by him after all, so he can’t be as ignorant as Tarver makes him, and he is fully aware, as many adults are not, of his own abilities and limitations. He recognizes the greatness of Lovborg’s work and, at the end, he knows that he has the organizational skills to restore Lovborg’s work. Hailey Gillis, who was so impressive in Soulpepper’s The Dybbuk last year, gives an unaccountably one-note performance as Thea Elvsted, a former schoolmate of Hedda’s who is in love with Eilert Lovborg. Gillis seems able only to portray Thea as weak and wracked with fear which contradicts what we learn of her in the text. Thea, after all, is another Nora from Ibsen’s A Doll’s House (1879) – that is, a woman who has the strength of character to leave her husband when she realizes he takes her for granted. This is an idea Hedda would never entertain because she is so afraid of scandal. Thea, too, is aware that she helped reform the wild Lovborg, another strength Hedda does not have. Contrary to the simpering dishrag that Tarver has Gillis give us, we should see Thea as a rival the way Hedda does except that Thea is both more confident and more sympathetic. It’s hard to know exactly what Christopher Morris is doing as the rogue genius Lovborg. Morris looks the part with wild hair and a neo-romantic overcoat. But Morris speaks at a decibel level significantly below those of the other actors, presumably to make Lovborg appear intense. In this case, it merely makes him seem weak. We should notice some change in Lovborg before and after he gives into his nemesis alcohol, but Morris does not show it. We should fear the death wish that haunts Lovborg’s existence, but we do not. It has always been one of the better aspects of Canadian Stage that it still includes a classic work among the cutting-edge pieces it presents. This helps give us perspective since plays like Hedda Gabler were cutting-edge when they first premiered. The best productions of Hedda Gabler show that the play has not lost its modernity because the combination of poetry and irony in Ibsen’s style still seems new and the nexus of social, political, sexual, psychological and domestic issues united in Ibsen’s plot has not changed as much as we would like to think. It is a great pity then that Tarver who has enlivened so many 20th- and 21st-century works should be defeated by one of the most important creators of modern drama. Photos: (from top) Cara Ricketts as Hedda Gabler; Cara Ricketts, Frank Cox-O'Conell and Steve Cumyn; Hailey Gillis, Cara Ricketts and Steve Cumyn. ©2016 Michel Mersereau.